At 23 years of age, Rochelle Grindley is one of the youngest sous chefs on the local food landscape- a career she takes very seriously. The Usain Bolt’s Tracks & Records employee remembers wanting to work in the kitchen from as early as seven, when she was at home with her mother and brother. “My mom was teaching my brother how to cook one day and I got upset, saying ‘He shouldn’t be the one learning; I’m the girl,’ they smiled at me and promised ‘your time will come,’ and yes it did,” Grindley fondly recalls. The decision to become a chef was an easy one for Grindley. 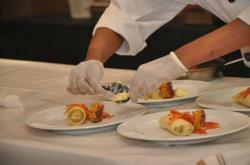 “I decided to pursue my career as a chef when I was about to leave Hampton School and have never looked back. It’s definitely my passion” Grindley noted. Hobby turned a career pursuit, as she became a part of the joint culinary programme at the University of the West Indies and the University of Technology. At the age of 19, she acquired a Bachelor of Science degree in Hospitality and Tourism Management, majoring in Culinary Arts Management with Upper Second Class Honors. After her internship, she was hired at The Terra Nova All Suite Hotel as a sous chef, where she perfected menu costing. She then applied for a position at Usain Bolt’s Tracks & Records, the state-of-the-art restaurant and lounge in Kingston, an opportunity she jumped at, as she saw it as a big opportunity to be part of something special. Launched by the KLE Group Ltd. in 2011, Usain Bolt’s Tracks & Records is a revolutionary force in local dining, showcasing Brand Jamaica through premier entertainment and cuisine. 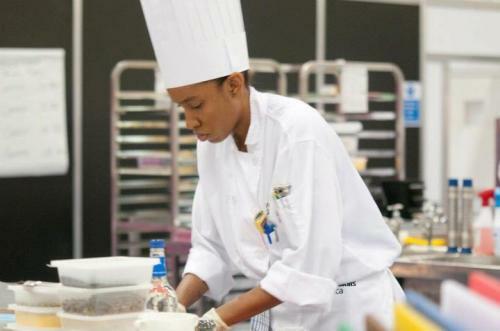 In 2011 Grindley represented her country internationally in London in the World Skills Cooking Competition, and in 2011 and 2012 in Miami as a member of the National Culinary Team. Grindley’s continued conviction was made even stronger when she learned that Usain Bolt’s Tracks and Records’ mandate was to showcase Jamaican cuisine- something that has always been close to her heart. Grindley has always had a strong belief that our local fare can be among the world’s most famous, as big a hit as Indian, Japanese or even Italian. Her mission is to be a key ‘ingredient’ behind a foray of the island’s vast food offerings; beyond jerk, into the international marketplace. 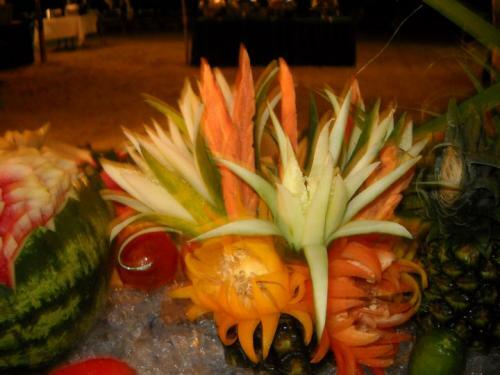 “As our Coat of Arms states, ‘Out of Many One People’, Jamaican cuisine is very diverse as it is made up of different cultures from Indian, Chinese, Spanish, among others, intertwined together to develop our delicate yet unique cuisine, something I think we as a country need to be proud of,” said Grindley. She added that a world class establishment like, Usain Bolt’s Tracks and Records with its wide variety of authentic local food, along with its prospects for global expansion, is the ideal vehicle to accomplish this. Other popular dishes on the menu include Usain Bolt’s Tracks and Records’ signature Jerk chicken spring rolls, jerk pork and the curried seafood crock pot. The restaurant also offers local spins on international offerings such as satay beef, island nachos- made with plantain chips instead of corn chips; great burgers and wings infused with Jamaican flavours, noted the sous chef. The award winning sous chef, Grindley leads a team of over twenty persons daily in the Usain Bolt’s Tracks and Records kitchen, assists with inventory management and excels at menu planning . Nicholas Taylor, General Manager at UBT&R believes Grindley has the scope to grow with the future plans for regional expansion of the restaurant. “Rochelle is an extraordinary person and an exemplary sous chef. We believe that her hard work and knowledge of the industry will play a big part in the way forward,” shared Taylor. “The job requires ‘An exceptional leader who is able to develop and motivate others to achieve targets… and a very proactive individual who has a rational approach to challenges, being effective yet efficient working in a high pressure environment,” said Grindley, adding that she is proud to be a part of a positive team spirit in the Usain Bolt’s Tracks & Records restaurant. Passionate about cooking and inspired by a great brand, Rochelle shines in the Usain Bolt’s Tracks and Records environment. Taste her true Jamaican spirit at Usain Bolt’s Tracks and Records.